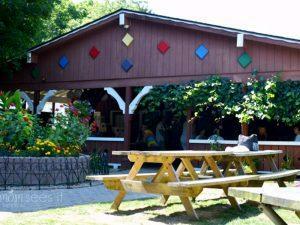 The Heineman Winery is a Put-in-Bay tradition. Dating back to 1888, this winery is the oldest on the island. It is also the only winery the makes the wine they sell. Visit the winery for tours of the vineyard, the Crystal Cave, and enjoy tastings and cheese in the beautiful Wine Garden. Gustav Heineman arrived from Germany in the 1880’s. He was quick to recognize Put-in-Bay Island as a perfect place to grow grapes. Due to Lake Erie’s tempering effect, the island has a longer growing season than the surrounding areas and rich soil. Heineman’s opened in 1888 with the discovery of Crystal Cave in 1897. By 1900, the island had caught on and 17 wineries were now in operation on tiny South Bass Island. Sadly all but Heineman’s would be done in by prohibition. The Volstead Act was passed in 1919 and the Put-in-Bay wineries quickly closed up shop. Gustav’s son Norman ingeniously decided to offer tours of the magical, wondrous Crystal Cave which contains the largest Geode in the world. He also sold unfermented grape juice. The family tradition continues today with the third and fourth generation cultivating the 50 acres. Growing their own grapes affords them a great deal of control of the tannins and the taste of their products. This is known as “vine to wine.” The grapes include the Concord and Catawba. They specialize in Sweet and Iced Wine but also make a robust Cabernet Sauvignon and dry Chardonnay. The favorites are the Pink Catawba and Niagara. Once your winery and cave tours are complete, enjoy tastings in the Wine Garden. This is an ideal spot to share with someone special. Enjoy a glass and cheese plate and say cheers to summer. The Gift Shop on-site sells bottles individually and by the case. Take some home for your next meal and gift your favorite bottle to friends back home. Please note that Heineman’s can only ship within Ohio.